Nicolai Fuglsig's 12 Strong tells the previously classified story of the first American military action in Afghanistan after 9/11. The mission took 12 men deep into Taliban-controlled territory to liberate a mountain stronghold with the help of the splintered Northern Alliance, made up of disparate Afghan militias who hated each other. It was a volatile situation, and the soldiers who volunteered for the mission had to ride horses in order to navigate the tricky mountain terrain. It's a fantastic story, to be sure, modern warfare mixed with ancient tactics. Yet 12 Strong falters in its execution due its glacial pacing and bland sense of style that borrows from everything from Black Hawk Down to Saving Private Ryan to Gladiator. The film's strongest asset is its cast. Lead by Chris Hemsworth, and featuring Michael Shannon, Michael Peña, and Trevante Rhodes, the actors do their best with the limited material they are given to work with. Shannon and Peña are done no favors by their thinly written characters (especially Peña, who seems to be there only for wisecracks), but they throw themselves into the roles anyway. The screenplay by Ted Tally and Peter Craig is surprisingly weak (especially considering Tally penned the remarkable screenplay from The Silence of the Lambs), often resorting to awkward exposition in the form of two off-site commanders who attempt to provide context to the mission. We are also given a villain in the form of Taliban commander Razzam (Numan Acar), whose only purpose in the story is to stand around and look evil. We are introduced to him in a throwaway scene meant to illustrate the Taliban's cruelty, but he's such a non-entity in the story that it almost seems like an afterthought. Yet by far the film's most egregious fault is in its portrayal of the war in Afghanistan as some sort of quick victory. The speed with which the horse soldiers conquer the city of Mazar-i-Sharif is hailed as a major victory for US forces. And while the speed of their achievement is certainly remarkable, it is not indicative of the war as a whole. The film conveniently ignores the fact that it dragged on for more than a decade after this, becoming America's longest military engagement in history. If one just watched this film and had no knowledge of the war in Afghanistan, they'd think America coasted to victory pretty quickly. It seems incredibly irresponsible to frame the war in such a way, without the context that it needs to be accurately portrayed. 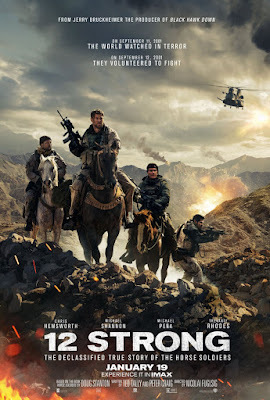 Make no mistake, 12 Strong is pure propaganda, and not particularly good propaganda at that. It's not in the Alexander Nevsky vein (although one may find oneself longing for Sergei Eisenstein's mastery of pacing and emotion), instead it's a rote re-framing of a devastating military conflict that takes one very specific victory and makes it dishonestly representative of the war as a whole. Add to that its lazy copying of Steven Spielberg's 60 frames per second cinematography from Saving Private Ryan, and a scene where a character buries a piece of the World Trade Center in Afghanistan in a shameless ripoff of the ending of Gladiator (not to mention one painfully manipulative fake-out death), and you have a generic war movie without any real sense of history or personality of its own. It takes a strong story and neuters it with dull characters and tedious plotting that makes it feel longer than the war itself. 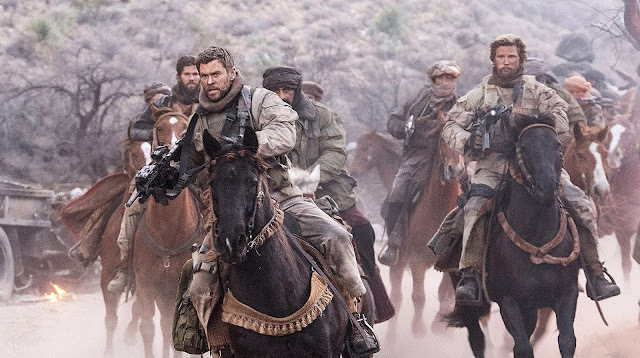 12 STRONG | Directed by Nicolai Fuglsig | Stars Chris Hemsworth, Michael Shannon, Michael Peña, Trevante Rhodes, Navid Negahban, Geoff Stults, Thad Luckinbill | Rated R for war violence and language throughout | Now playing in theaters everywhere.